Ease of use: Kashoo’s website is very crisp and has a great design and brand but this did not carry through to the software itself. The software felt like a webpage with too many fields and tables and we thought this could have been laid out much better/efficiently. The navigation of the website was pretty straight forward with lots of little shortcuts to related functions. Speed: Kashoo is fairly fast to navigate and enter transactions but there are some major floors in our opinion. For example, there are no shortcut keys and it is not really keyboard friendly, most of the navigation would be done with the mouse. Also, as far as we could see there was no way of entering transactions in and out of the bank account without assigning them to a customer or supplier. So if you do not raise invoices to customers (like a shop for example) then this is an unnecessary step to complete when entering transactions. Features: Kashoo is marketed as being simple to use which means that we would not expect to find bells and whistles. 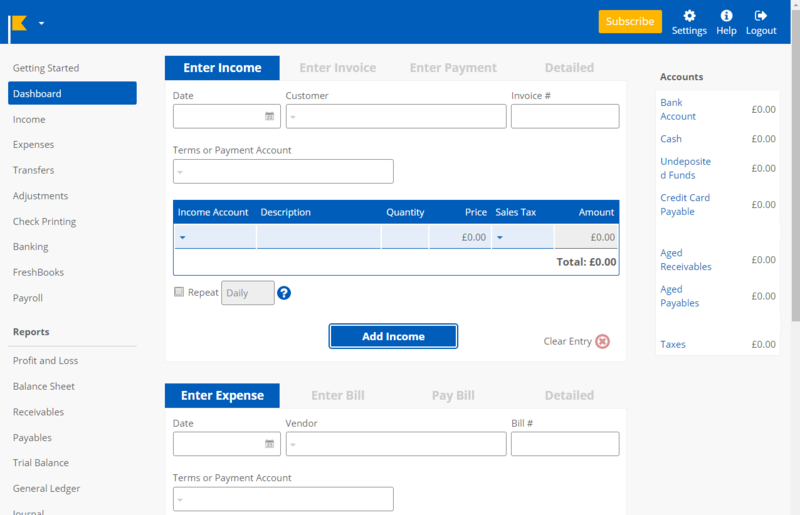 That said, it does have the ability for automatic bank feeds which is a bonus, and the ability to set up products and services to speed up invoice creation. However apart from that we struggled to find other features to mention. Support: We were very impressed with the support. Included in the price is telephone support, a huge bank of articles and short videos online for most features, email support and even webinars. The ‘getting started’ video was also very useful, easy to follow and nicely explained. Reporting: A good trial balance with an okay profit and loss and balance sheet. The transactions (audit trail) report was confusing to understand but there was the ability to drill down into accounts to see how the figures were made up. It also has an activity audit trail so if you had multiple users you can see who did what and when, which was a nice touch. 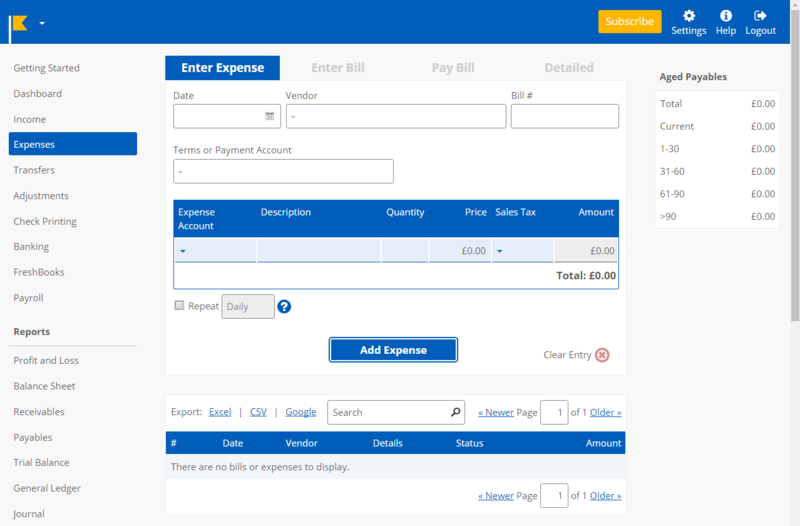 Price: Most people are going to need the business edition as it allows multiple users and access for your accountant but even that is fairly well priced, especially given the support which is included. VAT Handling: Unfortunately Kashoo does not handle VAT very well at all! As the software is generic and used in most countries you must set the VAT up yourself within the software which isn’t exactly straight forward. For example you have to set up new nominal accounts for the sales tax control account and purchase tax control account and the reports for VAT Returns were non-existent as far as we could tell. The company does market itself as simple, so why then ask customers to set up their own VAT nominal accounts? This should have been done automatically when the country was entered at the start. Cash accounting and flat rate VAT are also not supported. If you have a VAT Registered business then this should be the stumbling block for you. The bits we liked: We particularly like the ‘items’ feature which sets up products or services so that it reduces the time it takes to complete sales or purchase transactions. We also liked the activity audit trail which we think could be very useful for a lot of businesses, especially those with multiple users. The bits we didn’t like: The nasty VAT handling and the issue with needing a customer or supplier for every transaction. We think that some bookkeeping knowledge/experience would be required but by no means an advanced understanding (unless you’re tasked with setting up the VAT). The help and support is good but it can be hard to figure out some parts of the software.